Due to blockade of Cherbourg harbour by French fishing boats the race was changed to a loop round Ocean Safety buoy in the channel. Beat out of the Eastern Solent from the start and lost out to the Flying Fish as they kept over to the mainland shore which looks like the best option with a Easterly breeze. Behind Fish and Pyxis at the forts and single tack to Ocean Safety 25 miles to the East. 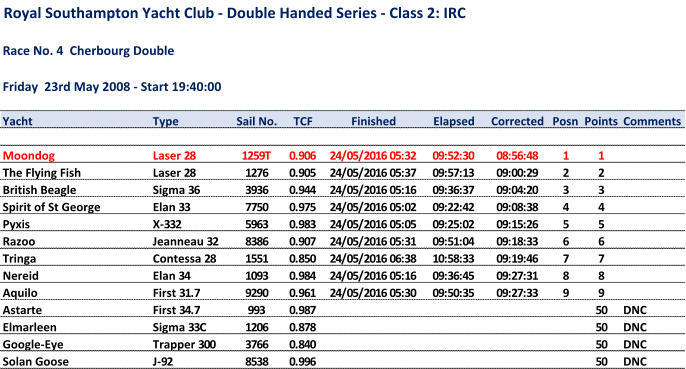 Lost touch with rest of boats as night fell but the majority of the fleet seemed to be going too high for the mark whereas we hit it spot on around 01:00 just before the tide turned. Spinnaker up after rounding the mark and managed to hold it for the first 15 miles back to the forts before the wind came forward. No problems dropping the kite and held the same course all the way to the finish. Couple of the bigger boats radioed in before we got to the line but not far enough ahead to worry us and reassuring to see the Fish about four minutes behind. Little concerned to see if any of the lower raters had come in too close behind us but turned out not to be and got first overall.